Company Picnics, Weddings, Retreats, Conferences and more! 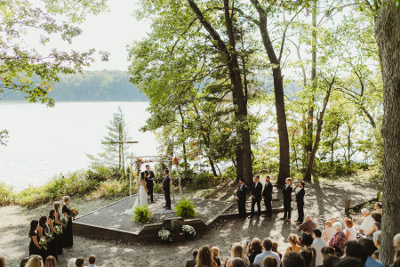 Located on beautiful Big Blue Lake, just a short drive from North Muskegon, Whitehall, Montague and Fremont, Camp Pendalouan is the ideal spot to host your next event. We allow you to spend quality time with people who are important to you while enjoying the simple pleasures of camp life. Any group can coordinate with our staff to plan a week, a few days, or an all-day program. We’ll help with as much or as little planning as you need. Pendalouan is a great place to foster a sense of self-confidence and friendship for members of any group. Church youth retreats, outings for adults, parent/child weekends, and family reunions all have a place on the shores of Big Blue Lake. 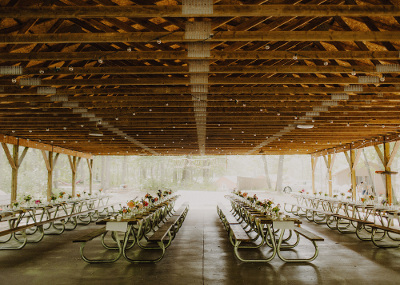 Looking for a charming, rustic wedding venue? With stunning views, attentive staff, and a rustic charm, Pendalouan is the perfect place to host an outdoor or indoor wedding. Pendalouan’s staff will work with each couple to craft the perfect day. Weddings often book a year in advance, so contact us today for information. Individual Building Rental - Rent a space at Pendalouan for your guests. Day Facility Rental - Get exclusive access to Camp Pendalouan for the day. Overnight Facility Rental - Craft an overnight experience for your guests. Do you have a cohesive team? Camp Pendalouan is a great setting for Corporate Team Building! Pendalouan offers a variety of facility rental options, Pendalouan-led team building experiences and great food! 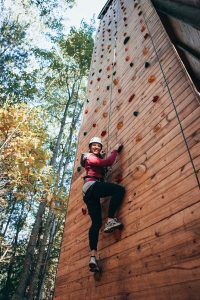 You can rent the facilities and set up your own program or work with our Camp Director to develop a Pendalouan staff-led team building experience based on your goals. We have several program options available including High Ropes Course, Group Challenge Course, Zip Line, Small Group Adventure Racing and more! Camp Pendalouan would love to host and cater your next event. We offer a variety of affordable spaces, activities and menu offerings depending the desired event. Let Camp Pendalouan enhance your experience with options ranging from a 2-hour to an all day or overnight event. Pendalouan can help you plan a conference, meeting or retreat specifically tailored to meet your needs. Looking to host an exceptional employee appreciation event this year? 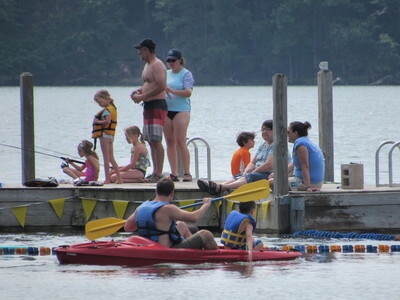 Camp Pendalouan offers an ideal location and a large selection of activities. Accommodates 10 - 1,000 guests! 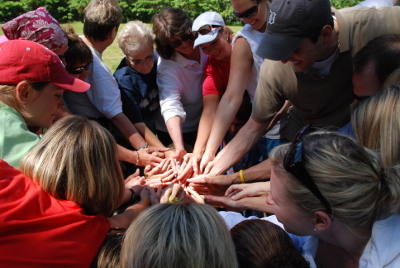 Work with our Camp Director to develop a retreat that meets your company’s needs. Potential activities include canoeing, kayaking, target sports, zip line, high ropes, climbing wall, hiking, horseback riding and more. We also have catering options available. The beautiful site overlooks Big Blue Lake and is the perfect setting for many special gatherings. Camp Pendalouan specializes in customizing group experiences. Catering options and activity options available. ...for more information in designing a custom experience at Pendalouan.